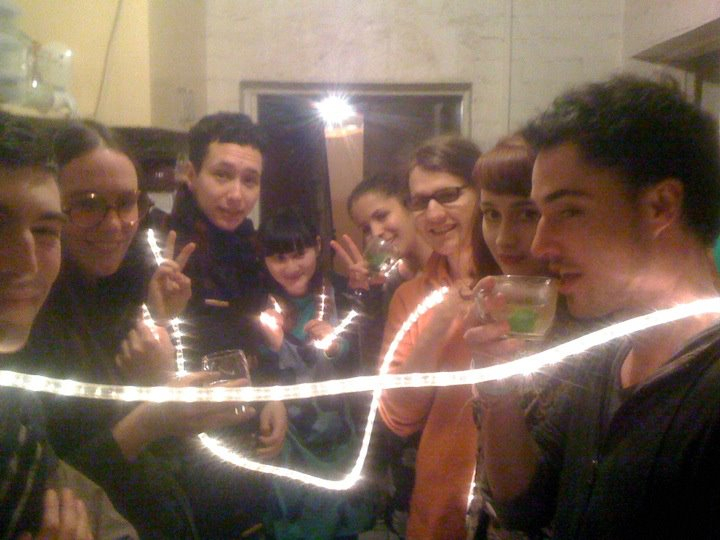 This is a photo of my friends and I at a party last night which was really nice and fun. It is so great to be back in Melbourne with everyone! Last night was really fun and this morning was really fun but now I'm in a really un-fun bad mood at work I think because I'm kinda tired and grumpy and wanted the fun to continue on all day rather than being cut short. This morning I had breakfast made for me which was just so lovely, and the yellow sun streamed into the bedroom and everything was kind of sepia and warm and divided softly where the light came through in the slats in the blinds. I was grinning with my eyes closed although I looked terrible with puffy party eyes and skin from not taking my makeup off to sleep. I think it's raining outside now, a change from this morning that seems fit with my mood. You know those times when you get so wrapped up in something or someone or sometime that you just want to totally forget responsibilities of a regular existence and like stay in the bubble of sheets and exhales and the smell of poached eggs. I am someone who seriously struggles with being able to do this. The real world calls me too loudly, or perhaps I just listen for it. When I explained this to someone while in the bubble world they said "But this is the real world" and I was stumped. How can the 'real world' be so good? I obviously have pessimistic leanings when it comes to life and the struggles of existence. But lately as I said a few things have stumped me in a sense that it's like gee that was really fun, or wow I like spending time with you, or gosh my friends are so great and lovely. It's me though to be sitting enjoying myself but waiting for something to go wrong, maybe it was my Catholic schooling but like, I can't have such a good time without something bad happening or 'being punished' or something. I know this may not necessarily be true but that's how I feel and as far as I'm concerned feelings are very much a part of the real world. Apart from that constant niggling though, that I don't think I will ever conquer - everything is pretty good. Below is a poem I wrote yesterday for publication in Yalei Wang's new writing Zine 'Criterian' which will be launching via Knight Street Art Space soon. Blah I'm going to go and have a Kit Kat.